The High-Q Driver can be clipped onto a musician's belt. A short cable on one end plugs into the guitar. An instrument cable is plugged into a jack on the other end. Muddy tone caused by instrument cables is eliminated. In addition, pickup bandwidth is opened up by more than one octave. The unit is powered by one standard 9-volt alkaline battery. There are no external switches or controls. 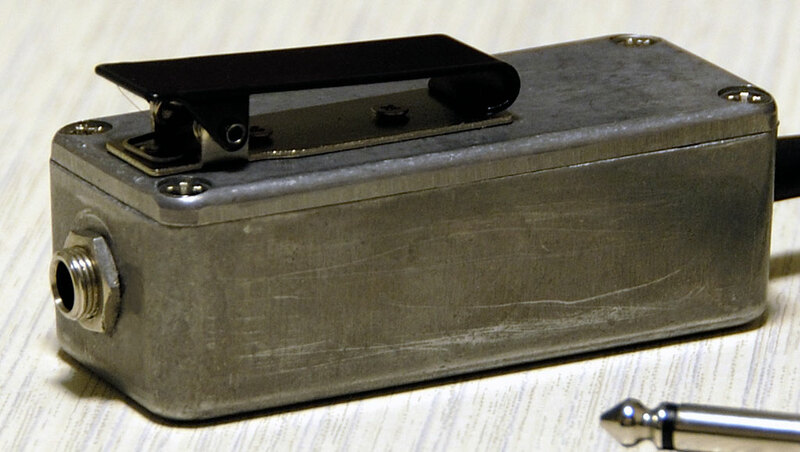 There is one internal rotary dial switch that can be used to adjust the tone for different pickups. 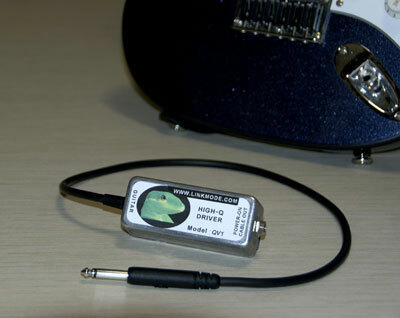 An electric guitar pickup gives its best frequency response when connected to a high impedance load. Any instrument cable plugged directly into the guitar will change the tone. A long, high-capacitance cable will reduce the bandwidth dramatically and muddy the tone. Impedance matching eliminates this problem; instrument cables will no longer affect the tone. If the guitar is connected directly to a long instrument cable, changing the guitar volume control setting also changes the tone. Impedance matching eliminates this problem. (2) High-Q filter - Even after impedance matching has eliminated the effect of the instrument cable, the bandwidth is still limited by the internal inductance and capacitance of the pickup itself. The output falls off rapidly above the pickup resonant frequency, typically at 4,000 to 9,000 Hz. 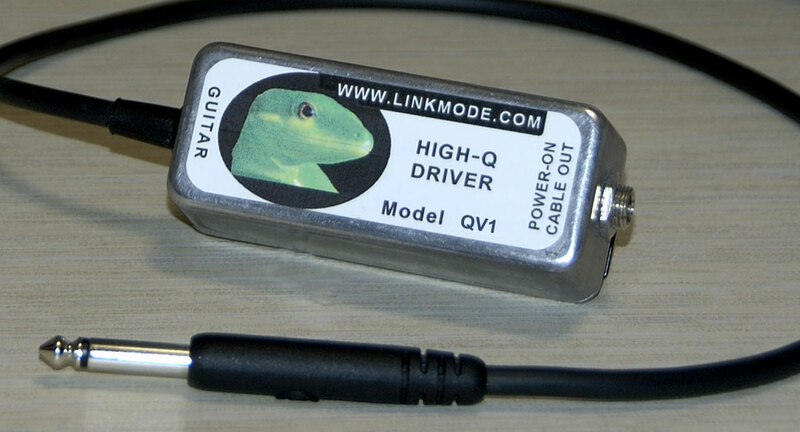 The high-Q filter gives a large gain boost just where the pickup output begins to fall off. The "3 dB bandwidth" is extended by more than an octave. A pickup that originally had 5,000 Hz bandwidth will now have about 13,000 Hz bandwidth. Pickup design is a trade-off among many objectives, including wide bandwidth, high output, low string pull, and long sustain. Adding 6 dB of active gain makes it possible to choose a pickup with lower output but better bandwidth, string pull, and sustain. Any noise from the instrument cable is effectively reduced by 6 dB, giving cleaner sound. The QV1 itself contains a high-performance, low-noise JFET operational amplifier that is very quiet. (4) High input level - To handle high output pickups, the QV1 combines rail-to-rail output, moderate gain, and a 9-Volt battery. It can take up to 4 Volts peak-to-peak input without clipping. (5) Effects - Guitar effects processors work fine with the QV1. Volume and tone controls on the guitar also operate normally. (6) Built tough - This unit can take a lot of abuse and just keeps on ticking. Die cast aluminum housing with four-bolt cover and riveted steel belt clip. Good quality cable with molded plug. This is one half of a Planet Waves® PW-CGT-05 cable. Input, output, and battery terminals are all protected against ESD (electrostatic discharge). Internal circuitry is protected against battery reversal. There are no external control knobs, switches, or lights - nothing to break. Powers on when an instrument cable is inserted. Powers off when the user (hopefully) remembers to unplug the instrument cable. (7) See impedance & high-Q for more technical details.